This diary describes our expedition to the Tibetan side of Mount Everest. We both reached the summit and had a beautiful view there. We used bottled oxygen (like most other climbers, too), and we had a Sherpa working as a high altitude porter. Since the discontinuance of the direct flight Frankfurt-Kathmandu by Royal Nepal Airlines, it has become rather difficult to travel to Nepal. In order to be there on Monday evening, we have to leave home on Sunday morning. Of course, like always the karabiners and batteries give reason to investigate the hand baggage in detail - this time in in Frankfurt, Bahrain, and Abu Dhabi. After 5 1/2 hours flight we are in Bahrain; the 40 minute long connection to Abu Dhabi (just 400 km away) departs with a delay of almost an hour. So we arrive there at 11 at night. A comlicated organizational procedure and a somewhat slow French group delay the bus trip downtown till after midnight. Until then in the hotel some food is served, it has become half past one. Nevertheless, the hotel is not bad - by the way, there are scales in the bathroom so we can check our weight before the base camp "diet". The night is short: At five o'clock the muezzin calls. But this doesn't concern us, we can sleep well from five to seven. After a good breakfast we are brought back the 30 km bus drive to the airport. Another 3 1/2 hours of flight, and we are in Kathmandu. The vias procedure has become a little more complicated: Fill the form, queue up at the counter, the visa fee is written on the form, queue up at the next counter, pay the visa fee, queue up at the third counter, and get visa and stamp into the passport. Those who have no photo have to queue first at the photographer. The taxi chaos in front of the airport has disappeared, everything looks very orderly, almost like not being in Asia. We are picked up by Asian Trekking and brought to the hotel. In Kathmandu not much has changed, except for frequent road blocks and controls by the military due to the state of emergency which is still in effect, and especially because of the bandh (general strike) that was announced for tomorrow by the maoists. Fortunately the bandh was postponed by three weeks, so we can do some food shopping for the expedition. There is even a supermarket where we can find a lot of things - even what we had been looking for in vain in Germany, like canned cheese. Organizational things are solved at the trekking agency; Miss Hawley's journalist collects data for the statistics, and "our" Sherpa comes for the mutual introduction. He had once been one the summit and several times on the north side of Everest. Minor problems that could arise more concern the language than alpinistic topics. Mingma's task will be to support our transport of equipment to the high camp, mainly to bring the heavy oxygen bottles, the gas cartridges and the tents up. Since the oxygen is very expensive, unfortunately we cannot afford to go to the summit together with him - we have only two sets of oxygen equipment. The weather is sunny and warm in the morning, with a thunderstorm tendency towards evening. So, one can rely on the fact that electricity will break down some time in the evening. Today's thunderstorm is very persistent, since three o'clock is continuously rains. Today will be a sightseeing day. 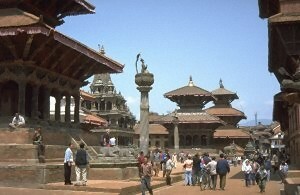 As we are the third time in Nepal, today we visit the third royal city in the Kathmandu valley, Patan. With a reasonably reliable city map, we find Patan Durbar Square without problems. It is about 1 1/2 hours on foot from Thamel. In the afternoon we check our air cargo that has arrived at the agency. There is also the baggage of other small groups, sometimes quite astonishing amounts. Some two person groups have more than twice as much baggage as we have, and we - at least as we believe - should already have enough supplies and spare equpiment. Later we go with our Sherpa for shopping his high camp food. Afterwards, before dinner we fist have to visit a money exchange office. Some details are still to be purchased: cookes and other food, on the other hand a clothesline, a big piece of plastic to cover or wrap our rucksacks for the transport, and a very normal saucepan. The latter things are more difficult to find than postcards, Gurkha knives and all the other useless stuff that is offered all around Thamel. The Swiss-German group1 arrived yesterday, and we also met a Mexican group. Like we, they are all going to the north side of Everest. The agency says that this year there are less people than last year. Nevertheless, for sure it will not become as quiet as on our trip to Minya Konka last year. This mixed group has some disadvantages: Because we have a group visa, it is difficult for members to travel home alone before the scheduled travel back. Our departure that was scheduled for today is postponed: Although the bandh was cancelled, attacks of maoist fighters to buses are said to have happened in west Nepal. The transport entrepreneurs have cancelled all overland travel until April 7 because of safety concerns. There is hardly any reliable information about the real safety situation available in Kathmandu - even with three English language newspapers. 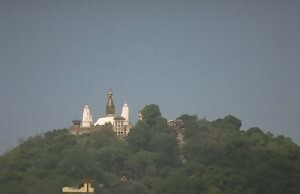 We go to Swayambunath and back, at the temple it is not so hot and the air is better than in the rest of the city. Finally we can leave today. After 4 1/2 hours drive we reach the border village Kodari without problems. The formalities on leaving Nepal are done soon (about one hour). On foot we cross the Friendship Bridge, and there is a first border control. A truck brings us up the 10 km long bumpy gravel road through the no-man's-land to the real control post. The trip reminds us more to a cattle transport, everybody keeps to find a hold on the loading space of the truck. The Zhangmu control post has upgraded considerably: there is an x-ray baggage scanner. Until finally the border is crossed, 3 1/2 hours have passed. Zhangmu has changed a lot since 1999. All of the main street is paved now, no more stinking mud track. Many of the boldly built wooden houses above the precipice have given way to new Chinese concrete buildings. Actually everything looks much more Chinese than three years ago. Probably, also the pigs that had rooted in mud and waste of the "international road" three years ago have meanwhile landed in the saucepan..
Before we can continue, there seems need to clarify the number of persons per vehicle with the Chinese officials. After a couple of phone calls and about two hours, the problem is solved. Of course, in the sense of the Chinese, since they have the controls. After two hours drive with best view to the gorge several hundred meters below us, we reach Nyalam (3750 m). We will stay here for two nights, otherwise it would be a too big step for our acclimatization process to go from 2350 m to 3750 m without a stop. In the afternoon we only have a little walk up to 4000 m, that's enough for the moment. Our food is Chinese now: rice with different side dishes which are served on plates for all of the group together. Most of us get quickly used to the sticks. Is seems unusual that dinner is not before eight in the evening. The reason for that is that all China has to use Beijing time zone which is 2 1/4 hours later than Nepalese time. So it doesn't get dark at half past six but around nine. 2. 2 In the following text, all times given are Chinese time if not noted differently. Already in the morning, the weather is not as fine as yesterday afternoon. Some sunshine, but already the first low clouds are coming from Nepal. In 4 3/4 hours we reach the 4770 m high mountain on the other side of the river, can enjoy some view from the summit and come back before in the evening the weather really becomes ugly. The bamboo which Mingma purchases here is rather expensive - 50 yuan for 20 sticks of a meter length. Also his advice to change money here turns out not to be the best: The rate is 7 yuan per US$ while we had got 8 in Zhangmu. The weather remains very bad the whole evening, it is snowing big, wet flakes. It snowed and rained the whole night. The view looks rather dreary. 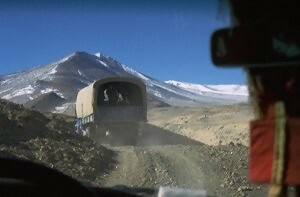 In the jeeps we travel on partly muddy, partly icy roads to Tingri (4350 m) over Lalung Leh Pass (5050 m) through a snow-covered landscape. We arrive there after 3 1/2 hours. Also Tingri has become more Chinese, compared to 1999. Of course the potential of touristic development is recognized by the Chinese. Several shops have opened along the street, and grandma's "pub" has a TV now. The weather has improved during the trip today, and 35 km before Tingri there was a beautiful view to Everest and Cho Oyu; the afternoon becomes more cloudy, however. The children of the village have become a real nuisance. As soon as a foreigner is in sight, he is surrounded, and they beg shouting "Hello, Money". Do they even know the difference between the two words? Beautiful weather this morning. Our acclimatization walk leads us to the hills east of Tingri, there is a great view of Everest (almost without clouds, only with ths usual snow/cloud banner), Cho Oyu, and of course everything standing around the two. News from the street: If the children don't reach what they want by begging, they begin to throw stones to the tourists. The dogs are not just annoying but some of them even malicious: As I learn later, I am not the first of us to be bitten without any warning. Wilco had the questionable pleasure already in Nyalam. My thick trousers didn't let the teeth come through, so an infection with rabies or other things seems not probable. We leave Tingri in the jeeps again. Just behind the village there is a road leading southward through the Tingri plains. It slowly gains height through different valleys with interesting narrows, until - yes, until a truck is standing on the road in front of us. It is the truck with our baggage, having left Tingri yesterday for the base camp. With engine trouble after 35 km, the three Sherpas have spent the night here. All our fruit and vegetable supplies for the base camp were killed by the frost. Seven weeks without tomatoes, cucumber, apples etc. Fortunately, the truck of the mexican expedition which came together with us is almost empty. So everything can be moved to the other truck, and we can continue the journey with the baggage, now a little more cramped. After 5100 m high Lamna La Pass is reached, the road gradually leads down to the valley with several interesting scree passages and river crossings. A road literally crying out for Toyota Landcruiser. The weather is very good, and the way up the Rongbuk valley is most impressive when one already sees huge Mount Everest in the background. In Rongbuk lamasery the monks give benedictions to the travellers who are heading to the mountain. Our way is eight kilometers further where, at the end of the road, the Everest base camp is situated at an altitude of 5170 m. 3. Like all of the Rongbuk valley it is a windy spot, always there is a strong wind down the valley. Therefore we establish our home in our two person tent as soon as possible. The journey took six hours including reloading the truck, lunch break and visit of the lamasery. Despite the late arrival of the equipment, the kitchen is operating already after two hours. There is soup, spaghetti, cauliflower and salad. When the sun is gone, it quickly gets cold and uncomfortable. So the evenings in the dining tent are quickly finished after dinner. 3 on the Washburn map between Samdopo Si and Toinzhubling, at P. 5176. In the night, the base camp sounds like a walrus colony: Everywhere there is grunting, blowing one's nose, coughing - and it is not the yaks who cause this noise. On the other hand it reminds of a highway parking: what is it good for to let the cars run for 15 minutes4, then rev up the engine once or twice and switch it off again soon after? This morning there are fog-like clouds over the valley, sometimes releasing a little soft hail. No sunshine, but also no wind. We spend the day mainly in the tent or sorting the loads for the ABC (Advanced Base Camp). 4 Generally it is a very annoying habit of the drivers to always leave the engine on. It cleared up yesterday evening, the night was calm, and also the morning is sunny, with almost no wind and very comfortable. Washing day - at ABC it will hardly be nice enough for any personal hygiene. 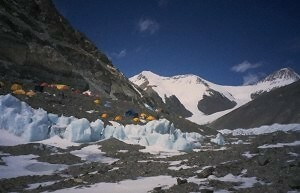 The Base Camp is situated not far from the end of Rongbuk glacier. Although it is still 20 km distant, Mount Everest looks huge as if it were be not a mountain, like all the others around. In front of Everest there are Changtse (7580 m) and Changzheng Peak (6977 m) - elsewhere these would be respectable summits, but here they simply hide the lower half of their huge neighbor. Through the deep cut of Lho La one can see Nuptse, standing beyond Khumbu glacier already completely in Nepal. Around noon there are quickly clouds coming up, and the view is gone. Rest of the day takes place in the tent again. The Swiss-German expedition has arrived and - some hours later - also their equipment. At dinner today we are only six: Adrian has got his kitchen, and George is never seen in the dining tent, he always stays in the kitchen tent with the Sherpas. As expected, the yak loading procedure is never without problems. It is discovered that we would need ten additional yaks - that means US$ 775. Either somebody has miscalculated already when planning the expedition, or something has changed in some regulations. It might just be the fact that we are here in Everest base camp, where the kilogram undergoes a strange anomaly. Anyway, the yaks become weaker and weaker every year, or the Chinese more and more greedy for money. 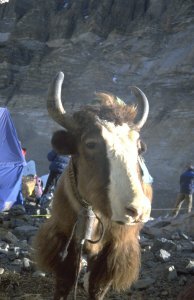 A yak could carry 60 kg at Cho Oyu in 1997; two years later it was 50 kg, this year only 40 kg. Before the yaks are loaded, we begin our way on foot. The route follows the left side (in the sense of the ascent) of the Rongbuk glacier up the valley. It doesn't gain a lot of altitude in the end, but the ups and downs on the moraine are tiring. After 5 km the trail branches off to the left up the little side valley that had been overlooked during Mallory's reconnaissance expedition in 1921. After the first steep slope up into this valley, again we have to follow a beautiful moraine terrain - three meters up, two meters down, in coarse and loose scree. Endless. After a total of 5 1/2 hours we arrive at the intermediate camp (5820 m) on the scree-covered glacier. Another half hour until our yaks arrive, then we can finally pitch our tent and have a rest. The kitchen is of course more modest than at base camp, instead we can hear the bells of the yaks ringing all the night. And all the night we fear that one of those three huge, shortsighted and nervous beasts that are standing directly before our tent might stumble over one of the tent cords and pull down the tent in panic. After a short breakfast and packing together tent, matress and sleeping bag (these things will be carried by the yak), we begin the second part of the long way to ABC. This day is even more strenuous than the first one. There is not as much up and down, but now we are at altitudes around 6000 m. Such huge areas around Everest are situated such high - we are on the way for six hours for only 600 meters of height gain, but 9 km distance. The middle part of the glacier is a huge mess of giant ice cliffs which - like oversized penitentes, up to 30 meters high - were formed by the intense sun radiation. Kitchen tent and our tents are pitched during the afternoon, and we begin to install ourselves here in the ABC (Advanced Base Camp). Bad surprise for the kitchen boy: The powder drink had obviously been filled under normal (sea level) pressure. As soon as the cover is opened, the foil cannot keep the overpressure, and there is a loud and very dusty explosion. The long way in the sun and the heigt of our new home at 6400 m cause - not unexpected, of course - heavy headache. After 1 or 2 aspirin, a lot of drinking and the long sleeping rests which are usual here at ABC, this soon improves. Nights are long here: At 6 o'clock the shadow reaches the kitchen tent, then it soon becomes cold. At eight there is dinner, and an hour later everymody leaves towards his tent. In the morning, the sun reaches the tent at half past eight - and who would voluntarily get up earlier, except for the short pee excursions during night. Our tent is wind-protected in a depression. Nice weather, but nevertheless today is a rest day. The ABC is the last location that can be reached without mountaineering equipment; before we go on, we have to get at least a partial acclimatization5, sort our stuff and install ourselves as comfortable as possible. 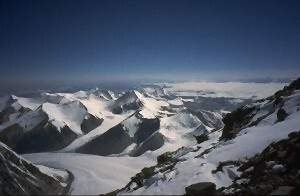 The camp is situated at 6400 m on respectively at the left (northwestern) moraine of the East Rongbuk Glacier, below the slopes of Changtse northeast ridge. Therefore it doesn't get any sun in the late afternoon, from 6:15 on. The small valley which begins at the camp leads directly up to the North Col. The southeast border of this valley is the northeast ridge of Everest. Our route, the normal route of the Tibetan side, will first lead us up to the North Col (7069 m); then we will follow the north ridge almost until it meets the northeast ridge (on the north shoulder, 8383 m). From there, we will follow the northeast ridge, avoiding the difficult sections in the northeast flank. There are three steps to be overcome, First, Second und Third Step. But until we can think about these obstacles, we will have to install three high camps (7000 m, 7600 m, 8200 m) and do a lot of height meters. At the moment, the ascent route appears very shortened due to the perspective, making it hard to estimate steepness or difficulty from "down" here at the ABC. It will be Saturday before we can make our first trip to the North Col: The Puja ceremony is scheduled for Friday, and before the Sherpas won't access the mountain. Since we should do the tent pitching and the first transport together with Mingma, Saturday will be the first possible day. 5 For a longer stay, the ABC is definitely at a too high altitude. A full acclimatization can be achieved only up to 5300 m.
Again, a cloudless day, again beginning with an annoying, gusty wind coming from the North Col. The last night was even more uncomfortable than the night before, with more headache. We will have to drink with more discipline - but then we will be on the loo all the time. In the course of the day, we feel better again. The short walk towards the North Col to the end of the moraine ("Crampon Point") is not a big effort, just 160 meters of height gain. The glacier seems to consist of perfect, transparent ice over large areas. One can see the cracks and air inclusions to a depth of several meters, it feels like walking on a huge glas plane. Meanwhile we successfully defined the meal times: Breakfast at 9, lunch at 2 and dinner at 8 (Chinese time). The cook was the only one to whom that was not clear. Sure we know that he sticks to Nepalese time (i.e. 2 1/4 hours earlier), but of course we didn't know that his watch was going wrong by an additional hour. But he is perfectly convinced that his time is the correct one. So we are living in three time zones simultaneously: Beijing (Chinese) time (GMT+8), Nepalese time (GMT+5:45), and the cook's time (GMT+4:45). Slowly, be are sleeping better at night. Still I have to dring about one liter during the night to avoid headache. Claudia must go out at least two times every night after all the liquid has made its way through her body. Yesterday evening there was a little snow hail, then the wind had increased as usual. This morning, there is more wind than the last days. From the North Col on, there is a huge snow banner on Everest, and the tent pole that suddenly fell onto the table in the dining tent was quite a surprise. The sleeping quality is maybe also a question of breathing technique and sleeping position. Anyway one can hardly sleep as long as the nights effectively are here. As soon as the sun is gone it becomes cold and windy, the only reasonable place to stay is the sleeping bag. This morning, we go on an excursion to Rapiu La (6548 m) - this is the pass connecting our valley with the valley coming from Everest's east side. The other side of the pass, however, consists of such wild cliffs that the pass definitely is not usable for travel. But there is a splendid view of Makalu, Lhotse, the northeast wall of Everest, and the Fantasy Ridge which separates this wall from the proper Kangshung face. Very impressive snow and ice formations, and now there is no more questions why the Fantasy Ridge is the last unclimbed crest at Mount Everest. The wind, blowing steadily at 40-50 km/h today, makes us learn today that it is him who sets the tone here. The way to Rapiu La, it was just rather cold. But the way back against the wind is an icy ordeal. The Puja was postponed to Sunday, this Friday wouldn't be a good day, they say. For us, that would mean another two rest days at ABC before anything will happen at the mountain - meanwhile more harmful than useful for our acclimatization. So we plan to bring the first tent to North Col ourselves today. Mingma insists on helping us there. 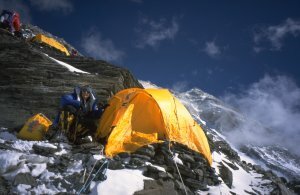 After four hours he has pitched the tent on the North Col and is back at ABC. For us, it takes somewhat longer to bring our stuff (sleeping bag, mattress, food) there. 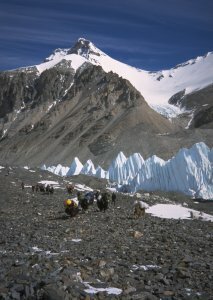 The way is not difficult and the steep glacier passage is well equipped with fixed ropes. But without a good acclimatization it is more than child's play to go to over 7000 m altitude with a load of ten kilograms. At the end, we need a short break after every ten steps. So, our times of 5 respectively 5 1/2 hours to North Col leave enough opportunity for improvement. The weather offers everything from cold and windy to breedingly hot. Because this mainly depends of the wind, it can change within minutes. The way back through the flat part of the glacier is strenuous due to the strong side wind. This morning there are no clouds as usual, but even more windy than the days before. So the Puja ceremony is a very cold event - the beer is freezing in the cups, and putting up the prayer flags is not easy in the strong wind. But the whole ceremony takes place with sunshine. Soon after noon it begins to snow, and also the evening remains cloudy. It is rather fresh when we enter the tent in the evening, -16°C . Dinner is worth to mention, so exceptionally bad as it is today: nush of overcooked potatoes, unidentified vegetable and overcooked yak. I don't want to claim that yak in any other state would taste good, anyway. For the first time, the weather is bad already in the morning. In case of good weather, we would have gone to North Col and stay there the night. The others walk into blizzard without hesitation - but we have no enthusiasm for that, since one cannot do anything beyond North Col at the moment before the expeditions Brice and Kobler have attached the fixed ropes there.6. The installation of camp 2 which logically would follow an overnight stay in camp 1 therefore can wait for some days. Anyway, it's too windy up there. Since we are in the ABC since more than six days now, it's time for a trip down to base camp at 5170 m for recovery. There one can still completely acclimatize, while this is impossible at 6400 m. In ABC everybody loses substance and power on the long run. The way to base camp is very, very long, however. Twenty kilometers at this altitude, with all the small and big ups and downs from moraine hill to moraine hill, take some time. Often it looks as if the yaks had made the yaks and no intelligent creature. After long 7 1/2 hours finally the base camp. Just in timeÖ After some drier phases in between it begins to snow again now. 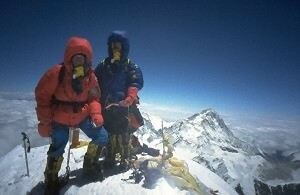 6 The biggest expeditions take care of the fixed ropes, since they can easier assign such work to some Sherpas. The other groups pay a fee for using the ropes (this year it was US$ 25 per person). Rest day in base camp. George is also here since a couple of days. Cook Maila looks after us very well; for lunch there are momos. We have again a washing day - in ABC it is simply too cold for that. The weather is more or less average, sun in the morning, later more cloudy and quite windy. We enjoy Maila's cookery, conversation with George, the books that we had left down here, and the nice weather - even if it gets very windy around noon. That doesn't matter in the tent. We sleep from ten (after dinner) to ten (when the sun reaches the tent in the morning). Almost everything like yesterday. In the afternoon, Daniel and Jorge come from the ABC. Beyond the North Col, nothing has happened yet, the snow is too deep and the wind too strong. So nobody knows when the fixed ropes will be installed or repaired. The morning is sunny, but windy like never before. THe wind is annoying, but we begin our way back to ABC. This decision makes uns stumble into a drama in five acts. Actors are Claudia, Hartmut, the weather, and the way to the intermediate camp. In good but windy weather we go southward along Rongbuk glacier. In Nepal, cumulus clouds are rising. The clouds have merged, made the border crossing in a breathtaking speed and shower us with snow. We turn back. After half an hour of fleeing, it is sunny. Looking back, the snow front has disappeared. New attempt towards ABC. Thirty minutes after our arrival at the intermediate camp, the snowfall stops, and within a few minutes all the clouds have disappeared. We didn't sleep well in the intermediate camp - first, the tent has a little slope, and secondly, this night all storms of the world seem to be around here. Suddenly in the morning, it is calm. With sun and -10°C we do our long way upwards to the ABC. The snow from yesterday doesn't make walking easier on the (anyway quite bad) trail. Like the first time we need six hours. The wind freshes up in the afternoon; on the summit of Everest the clouds are sweeping with an estimated wind speed of 200-300 km/h.7. On the way we meet Hans and Wilco as well as Mingma. Mingma had used the two days with less wind and largely equipped camp 1 on the North Col, but at the moment it is much to windy to go further up without the risk of frostbite. 7 Assuming that the summit pyramid is 150 m high and has the same (half) width, and the clouds making this distance in two seconds. After the long and unnecessarily strenuous (bad weather!) ascent of the last days we have a rest day today. Not much has changed here - sunshine in the morning, later some clouds, and the temperature in the shadow always stays below -5°C. Wind is different every time, but it never sleeps longer than three minutes. In the afternoon it snows intensely for three hours; then the wind calms down, the sky remains covered and it silently snows a little. There seem to be no reliable signs for something like a weather forecast, not even for half a day, never mind for longer. So we stick to reading and eating a little of our extra supplies in our two person tent. After midnight, a storm has joined the snowfall. The wind is very gusty here in quite a strange way. Sometimes one can hear the wind rushing down the valley from north col like an express train, that gives ten to thirty seconds of warning time. But sometimes the storm strikes completely unexpected. The tent moves and flaps, everywhere snow is trickling, and then it is (almost) quiet again. Until the next gust is coming, maybe in a couple of minutes, maybe less. The morning view out of the tent is not very motivating. Some mountains can partly be seen, in the front there is snowdrift on the glacier.8. In the dining tent everything is covered with a centimeter of snow, so we have breakfast in the kitchen tent. There we see other challenges which the cook is facing, e.g. prepare scrambled eggs while the yolk is still frozen when falling into the pan. So everything is clear today, we will not go to the North Col in this weather. One of the very many rest days. But if it really doesn't improve we go and hide in our tent. Those thirty meters to the kitchen tent for lunch and dinner are the maximum that we are willing to go more or less voluntarily. 8 Because it is rather cold, there is usually not much snowfall. This night it was 10 cm, we never had such a lot before. Yesterday's weather continued all the night. This morning, however, it is sunny and calm - only for five minutes. After that, the storm comes back with even more violence. About 100 km/h, we can hardly keep stand ing outside. Kitchen tent and dining tent are destroyed, helplessly we are standing in the storm. Hectically, everything that can be fixed is secured from flying away. In the icy cold we can stand with the back turned to the wind only, and with great difficulty we can understand each other shouting commands and answers against the storm. What can we do? Descend to base camp until the weather improves again? Some other thoughts: How will our tent on the North Col have survived the storm? Inside, there are our high camp sleeping bags, all stoves and the two tents for the other high camps. If that is simply blown away, our expedition is finished. But in the binoculars we can at least see a green rounded object on the Col. If it is damaged will turn out as soon as we can go there. Fortunately the weather calms down already in the late morning. Almost calm, -5°C, sunshine. Nothing gives an idea of the inferno that had raged only three hours ago. The cooks sew a new kitchen tent from the remains of the two old tents, and we pitch it together - this time hopefully more stable than its predecessors. Sunny weather. But our big enemy woke up again in the night: Like always the wind comes from the North Col, and if he won't calm down considerably this will be another rest day. Because it is so gusty, it is hard to say if the wind as stopped or only makes a short break. We hope for a longer peace and leave for the North Col. After the fresh snow of the last days, the trace at the fixed ropes is in bad state and slippery. During the last hour, the sun was replaced by a little soft hail. Again five hours. Our tent was not affected by the storm, and also almost all the other tents around look fine. Only the tents of the Kobler expedition which are standing further to the left on a small ridge have suffered a little. The two wrecks on the ground beside the Kobler village belong to Daniel and Jorge, as we learn later. Mingma had pitched our tent beautifully storm-safe. It would have been even nicer if he had chosen a more or less flat area. It has not only a slope over all of the tent, but there is also a considerable hillock in the middle. Outside it is storming and snowin, no idea about pitching another tent or correcting this one. So it will become a very uncomfortable night at 7000 m altitude. Even for something trivial like searching for a suitable place for the loo, care should be taken up here. Claudia falls into a crevasse, but she can get out alone again. If at all, then we slept very bad. Long, long waiting for the first dawn. But then we enjoy a great morning, sunny and warm (about -10°C) and calm. So we can correct our tent: untighten the cords, fold the tent upwards, level the snow underneath, put the tent back into position. Sounds no problem, but at this altitude, it means two hours of work. Four Russians go from North Col to camp 2 today, the fixed ropes seem to be there. We go back to ABC, following our scclimatization plan. The fixed ropes in the upper part are unpractical because they are very tight (one cannot rappel but has to carefully climb down secured by a karabiner). Further down, about half of the base camp comes up on their way to North Col, even causing some waiting times at the lowest ropes. But after 1 3/4 hours we are back in ABC in any case, and soon we raid the kitchen. Unfortunately the nice weather is gone already in the afternoon. Soft hail, not too much wind. Rest day in ABC to fill up our energy reserves after the stay at 7000 m. In the morning we do this with the daily egg, whether scrambled, boiled, or fried, together with something "similar to bread". For lunch we often have canned fish and french fries. For dinner we have a complete menu with soup, tyoically noodles (or similar) with sauce, and sometimes even canned fruit. We expect Mingma to come back from base camp today. Then we could go to camp 1 tomorrow, install camp 2 the day after tomorrow. 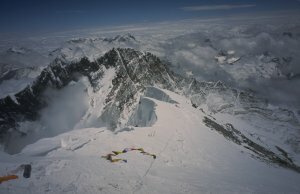 After that we would need only two more ascents: the first with a night at camp 1 and at camp 2, and the installation of camp 3; and the second ascent would include the summit attempt. So far our plan. Anyway, we already learned what one can think about following a plan here at Everest. Unbelievable - clear skies and no wind. Perfect for a fresh ascent to camp 1 to finally spend a comfortable night there. Mingma came from base camp yesterday and needs a rest day, so the two of us go to North Col alone. The trace through the steep slope becomes worse every time, again and again we slip in the fresh snow. Where part of the old ascent trace remained, it is trampled underfoot by the Sherpas running down on the same trace. Icy cold snowdrift and lull witz sunshine come and go. Having arrived on the Col, we have all the afternoon to eat and drink enough at cloudy but calm weather. Unlike three days ago, there are many people in camp 1, about thirty. The weather is not perfect, but with only a little wind. The way to camp 2 leads up the prominent snow ridge. All the ridge is walking terrain without any difficulty. The fixed ropes might prove useful in strong storm or bad sight; now they are unneccessary. Due to the shortened perspective looking up the ridge, one can hardly estimate distances, and the monotonous ridge seems endless. Where the snow ends in the rocks, after about 5 hours of ascent the beginning of camp 2 is reached. From here on, on the next 300 height meters there are several possibilities to pitch a tent in a terrain of scree and rock steps. All of this camp 2 is very exposed to the wind which we were spared of on the snow ridge. We deposit food supplies and stoves and descend again, one hour to camp 1. As this day was quite a lot of work - remember that camp 2 is higher than most of the summits around - we continue to ABC in order to relax there. It would not be a good idea to stay the night in camp 1 and go up again to camp 2 tomorrow - this appears too exhausing to us. Anyway it would not have worked to go to camp 2 today. Cloudy, slight snowfall. Jorge who had stayed in camp 1 comes to ABC in the morning and tells us about strong wind. In the ABC the wind is weak, but it snows a little again and again during the day. Always this undecided weather. The night was completely clear, in the morning it snows again, later the sun somes through the clouds. Mingma is busy installing camp 2 and camp 3. Until camp 2 is pitched, we stay in the ABC and recover well during some more rest days. The weather indeed allows us to wash some of our clothes. But it doesn't really dry, snow showers are sweeping over the clothesline. Soon we can put the frozen trousers into a corner of the tent and wait for tomorrow. Mingma was only in parts successful. 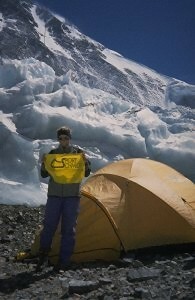 He fought his way through the storm up to about 7800 m - the planned place for camp 2 - and deposited two tents there. After that, however, he came back to ABC quite exhausted. Cloudless, almost calm. Weather for drying the clothes. The weather gives us an idea that it really can be warmer here than what we had had before. The Everest "veterans" kept on fantasizing about "T-shirt weather in the ABC", and we up to now couldn't imagine that. Again on our way to camp 1, this time with a weather never experienced before: almost cloudless and unbearably hot on the glacier. Even when rolling up the sleeves and trousers - the trousers are made for an 8000 m peak, correspondingly thick. And, climbing only in underwear today would certainly mean an immediate knock out due to sunburn. So we slowly make our way up, the heat is sometimes interrupted by icy wind gusts with snowdrift. No wonder that this results in my personal "record time" of 6 1/2 hours to the North Col.
Mingma will try today to pitch the tent in camp 2 and to bring oxygen bottles to camp 3. We will meanwhile ascend from camp 1 to camp 2 and stay the night there at 7800 m. This would be the last "compulsory exercise" before the summit attemt, based on what is thought to be the best acclimatization tactics for our route. The night was calm and peaceful, and the weather forecast of the Swiss group (Kari Kobler) indicates good weather until Sunday, for today even with particularly weak winds. But the north ridge is not very impressed by our weather report, the wind has storm strength. Not for us, please - after an hour we are back in the tent at camp 1. This seems not to have been a too bad idea: At 7800 m neither Mingma nor anybody else succeeded to pitch any tent in the storm. Five of the tents that stood there are said to be hardly more than the scrap value, and those who stayed the night in the intact tents had only held tight the tent instead of sleeping more than a minute. Nothing left to do for us than (once again) go down to ABC and wait for more quiet conditions. On the glacier plateau under the North Col it is really uncomfortable - side wind up to 100 km/h. Anyway, without doubt it has become warmer in the ABC during the last days. 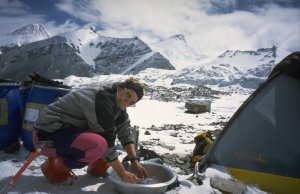 No more white frost in the tent, and occasionally we see cook Maila with a water canister coming from the glacier. Somewhere he must have found running water, so in the end we do not have to chop the whole glacier into pieces and put them into the saucepan in order to have enough water. In time, the rest days become a nuisance. Nothing to do, the books will soon all be read, the dining tent is uncomfortable (especially the primitive chairs there), and the others are mostly not very communicative. The weather is not bad, but too windy to sit outside. And, at the top of Everest still the winds go like crazy. Rest day, time for rumors. Adrian who had traveled to the basecamp with us and later joined his friends who traveled from Lhasa, has aborted the expedition and is said to have left base camp in a jeep without having paid for it9. More important runour: Next week there seems to be a good weather window with weak winds - if one can believe in the weather forecasts. But the window is seen by all forecasts, however in different lengths. If it would really last from Monday till Friday and the wind would be weakest on Thursday, it would exactly fit for a first summit attempt. Provided that Mingma succeeds in setting up camp 2 and bringing the remaining equipment to camp 3. Considering his drive and engagement, there is hardly any doubt about this. 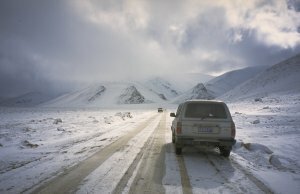 9 Two jeeps for the redular travel back are included in the price by Tibet Mountaineering Association. If individuals want to leave earlier, the jeep until Nyalam costs US$ 700 per vehicle. As often so shortly before the first summit bid, there are wild speculations which of the big groups would leave for the summit on which day. This has some importance for us, because the two of us alone would have no chance in fresh snow on the summit bid. But there seems to be quite a number of people being fixed for May 16 as summit day. so also we begin our (hopefully last) ascent to the North col. Although it is generally not very windy, there is a considerable breeze from the side in the glacier basin. Again five hours for the ascent. In the morning, we find cloud-covered sky with some sun rays. Mingma defines this as bad weather; he would take care of the installation of camp 3, but we should postpone our ascent to camp 2 to tomorrow. 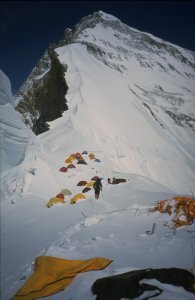 Many mountaineers leave camp 1 because it is not very windy; but it is probably not a very big fun to climb in the snow showers that come again and again during the day. Therefore we don't regret our hesitation. 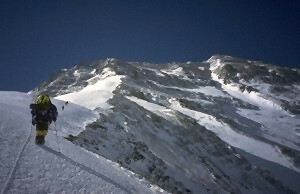 The other question will of course be if this day of sitting around at 7000 m was good or bad for our physical condition. The classical altitude problems (headache etc.) have disappeared long ago, however. Good weather again. Why is getting up always so complicated? The first two hours after sunrise, everywhere the frost is thawing and dropping down the tent walls. Everything is cold and wet. The day begins calm, and astonishingly this doesn't change all along the ridge up to camp 2. This means that there is a dreadful heat soon after late morning. We have to carry our personal equipment up to the "real" camp 2 at 7700 m, where Mingma has pitched our tent in a steep rock slope (but on a very good spot). The ordeal takes eight hours. From the lower to the upper camp 2 there is a relatively good trail, but at 7600 m everything is strenuous. Except for the Japanese. They are using oxygen from 7000 m on. Since then every member must carry an oxygen bottle, everyone has a personal Sherpa following with his personal baggage. One just needs to have enough money and be sufficiently decadent. An unexpected gift comes by in camp 2: We get a small packet of cream cheese from a Sherpa. I had missed such cheese already in the base camp, but I had least expected such things here at 7700 m.
After a night without good sleep, we begin our way to camp 3 with relatively heavy loads. After only hundret meters it is clear that we would be too slow like this. 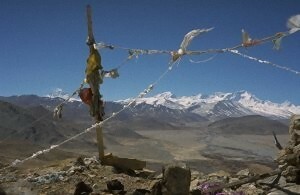 Therefore, at 7800 m we interchange some equipment with Mingma who brings the oxygen bottles and other things. From there on, we try the additional oxygen. This needs some getting used to: The glasses always steam up. But at least for me it clearly improves my performance (at 1 liter/min). Claudia is not convinced and omits the mask again soon. The way to camp 3 is very long and monotonous. At this altitude the altitude gain is extremely slow, every meter is a new success. Our seven hours from camp 2 to camp 3 therefore might not be too unusual. Camp 3 is situated in a steep partly snow-covered basin of rock and scree at 8200 m. Directly above the flank increases steepness, leading towards the north ridge. After our tent is well pitched and we are busy cooking, Mingma goes down again. First, there would be not enough space for three people in the small tent, secondly he wouldn't want to stay the night here without oxygen. Before the departure in the night, we try to find some sleep in the remaining hours. It is astonishing what a peaceful sleep even a small dose of "Russian air" gives. One o'clock Chinese time, it was a short night. We need two hours for preparing hot water for the day, eating a little and finally putting on the equipment and clothing. Many things are difficult in the small tent, but it is cold outside (though only -19°). The weather couldn't be better, only the wind (of course) is annoying. We leave at three, our pack contains a thermos, a couple of muesli bars, and two oxygen bottles for each of us (one small and one big bottle). Since the route is equipped with fixed ropes almost entirely, one can quite well find it in the dark, as far as the stupid oxygen mask allows. First we go to the right, up the flank towards the ridge. There is even a kind of trail, except for a few small rock steps, the terrain is completely without any difficulty. Around six o'clock we reach the ridge, and we can imagine a little bit of a view to the surroundings. But still it is dark. The route continues easily on the ridge or a little on the right, until a traverse into the slopes on the right side of the ridge leads to the base of the First Step. We reach it at sunrise. The First Step demands a little climbing at big boulders, which is quite strenuous at this altitude. After that, the route traverses through rather steep rocky slopes where the fixed ropes are really a good idea. Below us, the huge northwest face drops 2500 m deep to the Rongbuk glacier. We briefly come back to the ridge crest, where a small, calm snow depression behind a strange mushroom-shaped rock ("Mushroom Rock") appears to be a good place for a rest. We change oxygen bottles here, because after almost six hours the first bottle is almost empty. Another 15 minutes of traverse through the northwest face, and we reach the Second Step. Like at the First Step there is a small traffic jam, this one takes about ten minutes. We had expected the lower part of the Step to be easier; the boulders are bigger than they appeared from the distance. They are about grade III (UIAA). The ladder is moving sideways back and forth, but the really interesting thing is the traverse to the right, without any foothold. With the help of a little handhold of a rope loop, one can reach the terrace above. All this is a big effort for me, and I need a long time to recover afterwards. Claudia finds the solution: After changing the bottles, I had forgotten to adjust the oxygen flow. The regulator was set to 0.5 liters/min. For normal walking, 2 liters would be appropriate, for the climbing better 4 liters. So I climbed the Second Step practically without additional oxygen. With a flow of 2 liters, things clearly go better now. Above the Step, we follow the ridge again. In the scree here, there is indeed a clear path. Astonishing how few people are necessary to tread a path. Now we are walking in the sun; it was quite cold in the shadow (-25°C). The Third Step is about ten meters high and consists of snow-covered rocks, clearly easier than the other two Steps (I-II). Now we are standing in front of the triangular summit pyramid. Claudia is a little faster and soon disappears to the right side. It should not be far to go now. But on the right side behing the edge, there is a horizontal traverse. Coming from the snow, we enter scree-covered bands of limestone, completely free of snow. Looks like "at home" in the Alps, I feel reminded to Sulzfluh. But here, at 8800 meters, it is the wind that removes the snow rather than a warming sun. A short zigzag through the bands, and a little further up it becomes snowy again. Another few little hilltops and I finally can see the summit where Claudia and a couple of other people are standing. Twenty minutes for tewnty height meters, and I am standing on the small ridge, maybe twenty meters long. On the other side a gentle slope leads down to the southeast ridge. It is 13:50, it is cold, but there is almost no wind. And still the weather is beautiful. 8850 meters - all the world's mountains are below us. Lhotse looks so unspectacular from here, we had almost overlooked it. We easily recognize some prominent mountains like Makalu, Kangchenjunga, and Cho Oyu; around these, there is a vast sea of smaller summits. There are five or six people on the summit. In total, about twenty mountaineers were on the north route today. We see nobody coming from the south. At half past two we begin our way back. At the upper part of the Second Step there is a free-hanging fixed ropes which is supposed to be used for rappeling; further down it is quite a mess of ropes, and it is not obvious from above which rope is long enough to reach the bottom. Since the ropes cross each other several times, Claudia somersaults on her way down before noticing that she has to change to the other rope. The First Step causes no problem, however. In the flank leading down to camp 3, Claudia is much faster than I, so she goes ahead in order to take care for water in camp 3. In time, I become slower and slower and feel a strong exhaustion. Shortly before the camp, a Sherpa takes my rucksack, that makes it easier for the moment. But only for a short time; as the sun goes down, I suddenly cannot see well any more. During the day, I mostly had looked over the edges of my sunglasses because the glasses steamed up due to the oxygen mask. Now I have to pay for that, a kind of snowblindness. I see everything through a white haze and cannot find the footsteps in the snow. Instead of carefully working my way down step by step (what would have been the better idea), I hope for help and wait where I am. But it takes more than an hour until a Sherpa comes up and leads me to the camp. At eleven I reach the tent. My exhaustion did not get better during the night. Since I can carry no more than just my oxygen bottle, Claudia packs all important things (both sleeping bags, matresses etc.) into her rucksack. The weather is rather cloudy. After 1 1/2 hours we reach the small traverse at 8090 m, where we meet George. He wants to bring me further down with the help of a Sherpa; however, it takes an hour until Ang Mingma10 comes. Supported by George and led by Ang Mingma, I work my way down as fast as I can (and that is, unfortunately, only very slowly). The wind increases first slowly, then alarmingly quickly. As we finally reach the upper camp 2 at half past three, it has become a tremendous storm. Claudia recognizes the tent of our Dutchmen, but - on the next look it is gone, with all the equipment that was inside (e.g. Wilco's special paraglider which he wanted to use to fly from the summit). The Swiss-German tent is just being occupied by the Mexicans, and thus they probably save it from flying away. We enter a tent close by, George uses a neighboring tent. Our Sherpa Mingma comes around six o'clock, coming from the ABC. Actually we had thought he would have stayed in camp 2 or at least camp 1; but like this he comes not before the evening in order to support us. The support, however, then is very good - all the stormy night he melts snow and prepares beverages for us and George. 10 not to be mixed up with our Mingma; Ang Mingma is the Sherpa of the two Italians. The weather is sunny again, but the storm has become only a little better. 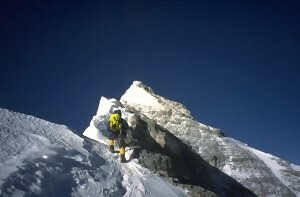 Nevertheless we must go further down, we cannot stay at 7800 m for days. With Mingma's help I slowly get down through camp 2; the snow slope further down is a bit easier than the irregular rock terrain, so the the snow slope "only" takes two hours. After a short rest, I am accompanied down the fixed ropes by several Sherpas who had been called up to the North Col by radio by George. On the glacier, I am supported by two of them by turns; so we proceed more or less well. Maila meets us here, he has a big thermos with hot tea. At half past seven, nine hours after leaving the upper camp 2, we are in the ABC. Here my frostbite at hands, feet, and nose are examined and provisionally treated. The weather is good, but very windy. For us, this is a rest day. We try to eat and drink as much as possible in order to get back on our feet again. As we see later, this didn't work at least for me - I should better have descended further down at once because I did not recover at all at that big altitude of 6400 m. In addition to exhaustion and the frostbite at my feet, cough and diarrhea appear. Another rest day in ABC; the remains of our food supplies are the basis for a little feast for all those present. After I have become weaker (because of the height and mainly the diarrhea) rather than recovering, we descend towards base camp. For some money, our cook Gokul helps us carry the baggage because I still cannot take a load. In 4 1/2 hours we only reach the glacier junction at the base of (P.6088), a distance which usually is done in 1 1/2 to 2 hours. The strong wind and my pit stops don't make it very easy today, though. 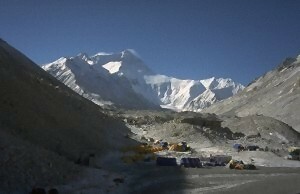 Mingma went up to camp 1 and 2 again today to fetch tents and equipment from there. Due to the storm up there it was impossible to reach camp 3. The night was not very comfortable, I mostly was busy with my cough - despite the piece of rock which Claudia had put under my pillow to make my sleeping position higher. Shortly after we leave our campsite, we meet the first Tibetan who eagerly takes the two loads. A bit further down a whole group is waiting which had been sent up from the base camp by Maila. They alternatingly support me, and so we make the way down to the base camp. That takes 8 1/2 hours, but now finally it is over. One cannot call it "back to civilization", but with a bit of luck we can get away from here by vehicle soon. Rest and cleanup day. The tent from camp 2 turns out to be so heavily damaged that it is not worth taking it back to Germany (including all the effort and cost to send it by cargo). The tent from camp 3 stayed up there anyway, because Mingma didn't succeed in getting up so high in the storm, and our material tent from the ABC almost falls apart upon touching it (but it already had been rather old). In camp 3 we also left ice axes, ascenders, headlamps, thermos, and a lot of other equipment. The Tibetan who had carried our loads yesterday had no permission: This costs a fine of US$ 30 to the liaison officer. Besides this, we pay our porters and helpers today. Still no car. The liaison officer has only excuses like the one that he had no telephone contact to Nyalam and therefore couldn't order jeeps. In the best case that would mean that the base camp is badly organized by the TMA. We suspect that we could quickly get a car provided we would "find" the appropriate amount of money. Since the jeeps for the way back are already paid, of course we will not pay twice. Today, suddenly there are the jeeps. We leave the base camp in not very good weather. After three hours on something that could be called a track with enough fantasy, we arrive in Tingri, and at half past four - after 8 1/2 hours - in Zhangmu. The Sherpas stay here and wait for the baggage, while we immediately cross the border. The border crossing costs another US$ 50 per person "visa change fee" because our group visa must be converted into individual visa. So says the liaison officer and takes the money. For others, so we learn later, the same procedure had cost only $ 25 even without having the group visa at hand. The Nepalese visa is even officially more expensive than the first one. It is a very strange regulation that the second Nepalese visa costs $ 20 more than the first one if one enters twice within half a year. By this guideline, the Nepalese government seems to express that it doesn't like to see its guests too often again. With a but we arrive at Kathmandu at eight in the evening (Nepalese time, that is 10:15 pm Chinese time). At seven in the evening we fly from Kathmandu to Abu Dhabi. There again the well-known chaos takes place: get the boarding pass for the next fligh at the counter, wait for the flight. This flight is endlessly delayed: First we wait for some missing passengers, then everybody has to identify his baggage again - personally, after baggage and passengers had entered in the plane. With a delay of 2 1/2 hours we arrive in Bahrain, forty flight minutes from Abu Dhabi. But most of this delay indeed is made up for until Frankfurt, we are only half an hour late there. But the plane was full up and therefore the flight quite uncomfortable, especially if one has frostbite at the toes and would prefer more space to put the legs higher. For my frostbite, especially at the toes, I get an infusion therapy with Heparin and Prostavasin and spend the following two weeks in hospital in Friedrichshafen. 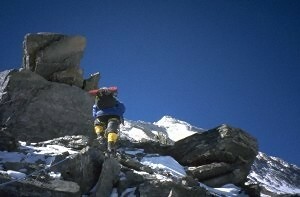 My health problems during the descent had practically the same evolution like at Cho Oyu 1999. Consequently, also in 1999 it was primarily strong exhaustion. Obviously in both cases I reached the summit well but did not have enough power reserves for the way back. The most worrying fact about this is that in both cases I did not feel worse than at other occasions. Nothing indicated such a dramatic development. Obviously. 8000 m peaks are not good for my health. But there are enough other mountains, I do not need another 8000 m peak. Maila played an important role as our radio "base station"
We would like to comment on a description of the descent from camp 3 that appeared on Everestnews.com on a separate page.